Many educators have contemplated the use of games as way to engage learners, or maybe thought about using some elements found in games to engage learners. A big hurdle for integrating games into a course is the amount of work it takes to build them to use in a course, even if you have the skill-set. Of course, you could always take the easier route and try to integrate an existing game into a course. The hurdles there involve cost and finding a game that supports the content specific to your course. There is another approach to bring game concepts into the learning environment that does not necessitate a huge investment of time, combining game design with problem-based learning. Create activities in your course that have learners design and contextualize the content of a game. You set the rules and mechanics of how the game will work, your students design how the content fits into that game. No one has to actually program or build a game. The idea is to use game mechanics as a tool to get learners to think about instructional material and how concepts inter-relate. So where do you begin? Start with what you know. What are your favorite games? These don’t have to be a computer or video game. Think about puzzles, board games, or card games that you have enjoyed. Are there elements of how the game works (mechanics) that can be applied to your course content? Do some ‘research’ (this is the fun part). There is something of a board game renaissance going on right now offering a boggling variety of board and card games. These cover a range of concepts, from pandemics to book collecting. The board game Chronology offers a simple mechanic that can lend itself to a variety of topics. The game works as the name implies. Remember, you don’t have to provide the rules for an entire game. Keep the activity focused on one element of a game that you can apply to content appropriate for your course and that supports the given learning objectives. Keep the rules simple. 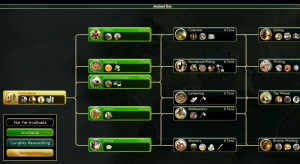 One of my favorite games is Sid Meier’s Civilization V. The purpose of the game is to build a ‘historical’ civilization from the ground up. A key element of the game is researching and building technology. In order to be successful at building technology and move your civilization forward, you have to understand how technologies are inter-related and build on each other. You can’t just research gun powder, for example, but have to first research and develop all of the underlying technologies to get there. The above image should be familiar to anyone who has used timelines, production trees or flowcharts. You may already be using something like this in your course. Game design can simply be a way to engage learners in developing these tools. A big strength of using Project-Based Learning in this way is that it doesn’t require a lot of time to set up and the project can easily be managed with tools that already exist in your LMS, using student Groups, or something as simple as shared Google docs. How far you want to push learner creativity in the design is up to you and the needs of your course. Here at Ecampus, we are lucky to have a marvelously creative Media Development Team who would be able to help build supporting material for your ideas. Depending on the complexity of the game you propose, it may even be possible to put your learners’ work into a game ‘shell’ that would result in a working version of the game. This, in turn, could be used as a study tool. Posted in Games, Interactive Diagrams, Resources, Tools & Trends, Uncategorized.